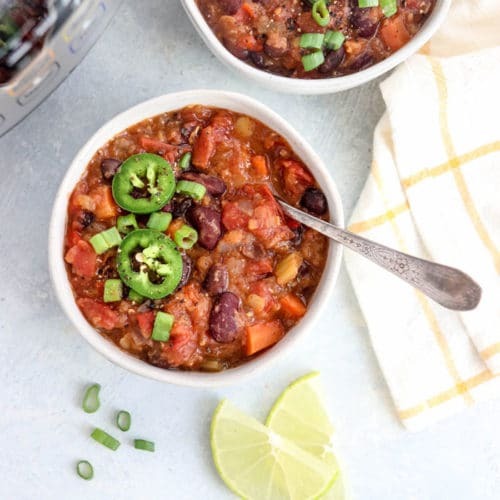 This INSTANT POT VEGAN CHILI is as fast & easy as it gets. Just "dump" the ingredients in the pot, press a button, and walk away! Ready in about 30 minutes. Add the onions, carrots, celery, bell pepper, garlic, tomatoes, lentils, water, black beans, kidney beans, chili powder, cumin, paprika, and cayenne pepper to the Instant Pot. Stir well, but keep in mind that there won't be a lot of liquid in the pot. (The veggies will release more liquid as they cook.) Do not add salt at this point, to ensure fast cooking of the lentils. Secure the lid and move the steam release valve to Sealing. Press the "manual" or "pressure cook" button, and cook at high pressure for 10 minutes. The pot will take 10-15 minutes to come to pressure before the cooking cycle begins. When the cook cycle is over, let the pressure naturally release for 10 minutes. The Instant Pot screen will read LO:10 when the natural release time has passed. Move the steam release valve to Venting to release the remaining pressure in the pot. Serve warm, with your favorite toppings. Sliced avocado, chopped green onions, and shredded cheese (if you're not vegan) are popular options with my family. Leftovers can be stored in an airtight container in the fridge for up to 5 days.